In March of this year, I read a piece by Seymour M. Hersh in the New Yorker Magazine entitled, “The Scene of the Crime: a reporter’s journey to My Lai and the secrets of the past. It was Hersh in 1969, then a young investigative reporter, who broke the story of the My Lai Massacre (March 16, 1968) and it’s cover-up during the Vietnam War. In the article, Hersh writes of his reaction as he returns to the scene of the crime forty-seven years later. It’s a very moving piece and well-worth reading. In the article, Hersh mentions then Secretary of Defense Robert S. McNamara and refers to his memoir, In Retrospect: the tragedy and lessons of Vietnam(1995) and the documentary film, The Fog of War(2003). Both the book and film were attempts by MaNamara to find absolution for his role in the Vietnam War. As Hersh states, McNamara acknowledged in his memoir that the war had been a disaster, but rarely expressed regrets about the damage done to the Vietnamese people and to the American soldiers. As I read the article by Hersh, devoured McNamara’s book, and watched the documentary, I thought of the quote by Sir Winston Churchill, Those who fail to learn from history are doomed to repeat it. Okay. I know what you’re thinking. What does an article on Vietnam and Robert McNamara have to do with the book, The Founding Fathers!? Not a whole lot, except that I saw the men who, despite their differences, were willing to risk their lives in order to follow a dream; by crafted our Declaration of Independence and our Constitution. 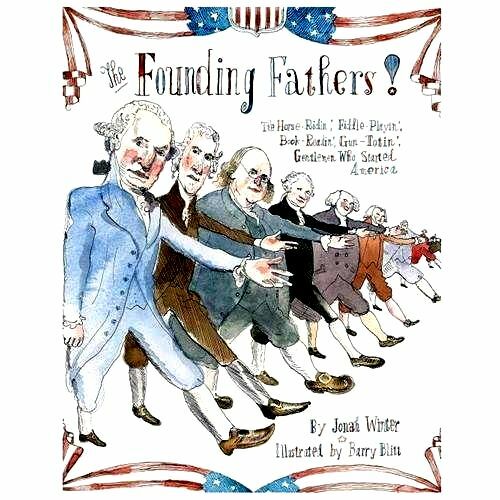 Americans always talk about “the Founding Fathers” as if they were a group of dads who, after a brief huddle, just hauled off and founded America. But what were they really liked? In The Founding Fathers!, Winter showcases the most well-known signers to show that they were just a bunch of guys with stomach issues and wooden legs and problematic personalities—who sometimes couldn’t even stand to be in the same room with each other. In truth, these men where not saints. The fourteen are George Washington, Benjamin Franklin, Thomas Jefferson, Alexander Hamilton, John Adams, James Madison, John Jay, Patrick Henry, Samuel Adams, John Hancock, Thomas Paine, Gouverneur Morris, Benjamin Rush, John Marshall. Don’t let the slim format with cartoon-like illustrations by Blitt fool you into thinking this book is only for the younger crowd who love history. The amount of information offered would make this interesting to middle and high school students studying American History. The double-page spreads, using reds, blues, and brown tones, gives a brief summary of the person's accomplishments, famous quotes, and then some pretty fascinating statistical information. A full-page portrait of each signer lists name, nickname, date. Did you know that John Jay (The Peacemaker; December 12,1745-May 17,1829) was 6' tall? Weight: skinny and thought the Boston Tea Partiers deserved fair trials. That Gouverneur Morris (The Aristocrat; January 31, 1752-November 6,1816) actually wrote the Constitution? He would risk his life and family inheritance by joining the revolution. Morris’ opinion on the Boston Tea Party? He opposed it. Winter’s humorous tone makes this book a rollicking read. 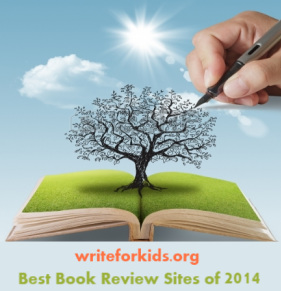 Author’s notes and a list of resources. It would have been helpful if the men listed were in some kind of order since the book does not include an index, table of contents or page numbers. The Founding Fathers! will fit perfectly with other titles celebrating the 4th of July. Sounds like a great book! I just requested it from my library. Thanks for a great post! Thanks for reading and commenting, Debra.